X-ray imaging studies are not very useful in the workup of patients with bullous pemphigoid. This is with high-dose oral prednisolone (30-60 mg daily) and steroid-sparing agents such as azathioprine or mycophenolate mofetil. Weekly methotrexate is also occasionally used. In general, disease control is easier than with pemphigus. Often treatment can be withdrawn after 2-3 years. Treatment often causes side-effects, especially as most patients are elderly. Occasionally localized or mild disease can be controlled with superpotent topical steroids, oral dapsone or high-dose oral minocycline. • Use mild soaps and emollients after bathing to prevent dryness of the skin. 1. Prenisone 1 mg/kg/day is usually recommended and is continued until new blister formation ceases. The dose is tapered to 20 to 40 mg. Thereafter, the dose is gradually tapered according to the clinical findings. • Topical steroids in general have been used in patients with localized bullous pemphigoid; however, recently topical corticosteroid therapy has been found to be effective for both moderate and severe bullous pemphigoid and superior to oral corticosteroid. • If patients cannot take corticoste- roids, dapsone, combination tetracycline and nicotinamide or azathioprine can be tried. • Combination prednisone and azathioprine protocols are available in the treatment of bullous pemphigoid. • Cyclophosphamide can be considered in attempt to reduce chronic long-term use of corticosteroids. • Left untreated, patients with bullous pemphigoid run the risk of sepsis from infected bullae. • Mortality rates are estimated at 17% at 1 year, 9% at 2 years, and 30% to 32% at 3 years. The clinical presentation and characteristic skin lesions assist in making the diagnosis of bullous pemphigoid. Specific laboratory tests, skin biopsy staining, and immunofluoroscence studies confirm the diagnosis. • Antibodies to the basement membrane zone are detected in the serum in 72% of patients with bullous pemphigoid. • Skin biopsy staining with hematoxylineosin reveals subepidermal blisters. • Direct and indirect immunofluorescence studies using salt-split skin detect the presence of IgG and C3 immune complexes on the basement membrane zone and can differentiate bullous pemphigus from other autoimmune blistering diseases. • Immunoelectron microscopy also reveals immune deposits on the basement membrane zone. Large tense bullae appear anywhere on the skin but often involve limbs, hands and feet. They may be centred on an erythematous or urticated background and they can be haemorrhagic. Pemphigoid can be very itchy. Mucosal ulceration is uncommon but a variant of pemphigoid exists which predominantly affects mucosal surfaces with scarring (mucous membrane pemphigoid). Bullous pemphigoid is an autoimmune disease with IgG and/or C3 complement component reacting with antigens located in the basement membrane zone. The diagnosis of bullous pemphigoid should be considered in any elderly individual with pruritic bullae. 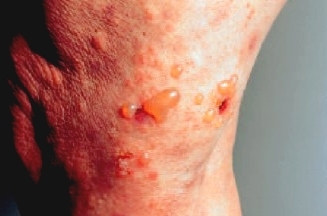 Bullous pemphigoid is a relatively benign pruritic disease characterized by tense blisters in flexural areas, usually remitting in 5 or 6 years, with a course characterized by exacerbations and remissions. Most affected persons are over the age of 60 (often in their 70s or 80s), and men are affected twice as frequently as women. 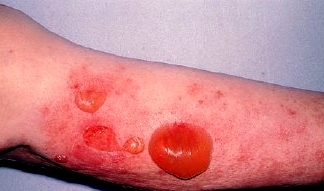 The appearance of blisters may be preceded by urticarial or edematous lesions for months. Oral lesions are present in about one-third of affected persons. The disease may occur in various forms, including localized, vesicular, vegetating, erythematous, erythrodermic, and nodular. There is no statistical association with internal malignant disease. • Bullous pemphigoid typically starts as an eczematous or urticarial rash on the extremities. • Blisters form between 1 week to several months.